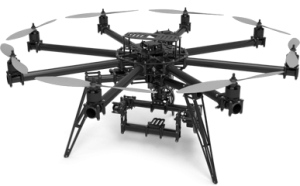 After many years of exploring the possibility of flying and working with drones I finally committed in August of 2012 to buy a beast of a drone known as the Freefly Cinestar 8 Octocopter. T0 get ready for its arrival I bought a small training drone to get my skills up. After approximately 50 hours of practice flight time indoors and outdoors I felt ready to set up and practice with the new UAV. I quickly realized that this drone was a battery drainer, so I quickly ordered more batteries and props. After many practice flights in manual mode without gps assist I started to feel more comfortable. With help of Ben Driver we got the Canon 7d mounted and ready to film and work on aerial photography skills. At this time I has a small clip online a local producer found it and reached out to set up a meeting. Dan Batchelor Productions then helped to film and edit my first Aerial Demo Reel for 2013. This demo reel led to quite a few jobs with visionaries in the field including Dave of Riptide Studios. Our first project with Dave was a commercial for Original Joes Restaurant: The “Thrill of the Dill” which has seen over 1 million views on youtube. This was followed up with the behind the scenes of “Thrill” where Dave shared his thoughts on using a drone to capture the shots he wanted. The next year I bought all the components to make my own Cinestar 8 heavy lift, a slightly more robust version with bigger props, dual batteries and a higher lift capacity. On it with attached to custom made Alexmos 3 axis gimbal to stabilize our newly acquired Canon 5D Mk3. This bigger UAV system with the new camera upgrade was huge for us and brought in quite a bit of aerial photography and aerial video work. 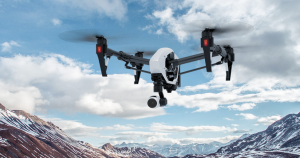 In 2015 we invested in the DJI inspire with 4K camera, a virtual plug and play system. This small system was a dream come true. Small, portable with Great battery runtime and an excellent stable image at 4K with raw photos. The live video transmission and on the fly camera tuning made us all smile. I fell in love with this system and the ease I could take it anywhere. No more messing around with finicky gimbles, a million batteries, and a huge unwieldy system that sounded like a flying lawnmower. 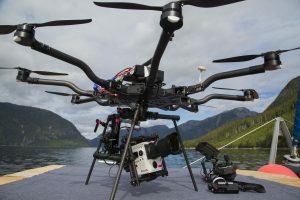 After flying these for a while I was hired by the infamous Ian McAllister, director of Pacific Wild to act as their Chief Drone Pilot for their IMAX documentary on the Great Bear Rainforest. Pacific Wild is a non-profit located in the heart of the Great Bear Rainforest on Denny Island. They are committed to defending wildlife and their habitat on Canada’s Pacific coast by developing and implementing conservation solutions in collaboration with First Nations communities, scientists, other organizations and individuals. In addition we have invested in the highly portable and super powerful Inspire 2 Pro with 5.2 RAW Video and 21 Mp RAW Stills. This machine is a true gem. 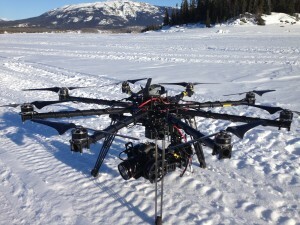 We flew it up in the mountains while filming for Mike Wiegeles Heli Skiing at -20C with a 90 mm equivalent lens on it and it performed flawlessly at 80 km/hr. The image is sharp, the stability phenomenal and the usability excellent. Older PostIMAX Production: Chief Drone Pilot for Pacific Wild IMAX film.